TODAY, many of the top echelon of sports car owners with well padded pockets are singing of a new love, the thundering Aston-Martin sport coupe. This little car -with a voice like Tallulah Bankhead has been so highly touted in various foreign publications and on these shores, by the fans capable of putting up about $7,000 for one, that all this smoke called for further investigation. Beach factory, where he is now manufacturing competition cars for international racing, I felt I had hit pay dirt. Before I could ask, Briggs suggested I make tests of his Aston-Martin. whips the cream on top of other small engines performance. It is light of weight, remarkably comfortable and rides fairly well for a sports car, but on one really bumpy road, I found the car dropping so fast under me that the metal roof was playing an uncomfortable staccato on my bald head. The instruments are all excellent and the speedometer fantastically accurate at high speeds. The hardware is top grade as it should be at these prices; after all-you can buy two Caddies for the price of most Astons. The steering control seemed to me on all three Astons I finally drove, to be dangerously exact; also in all three, I noticed a desire to leave the road at high speed which without the security of wings and stabilizers was not pleasant. My first fast run that day scared the pants off me. The black top was not exactly as smooth as the village pool table because the hot Florida sun is tough on roads and this one had some slight dips and rolls in it. As I built up speed, I instantly realized that this was no car for one-arm amateur driving. Both hands were definitely needed on the wheel which was starting to feel like a snake in my hands. I kept my foot flat to the floor and saw the tachometer climbing past 5,000 rpm and the extremely accurate speedometer touched 116 mph. I had all the confidence of getting out alive that a guy who finds himself in bed with a cobra has. This car has such extremely sensitive (in my opinion over-control) steering that it was like tearing over a heavy gravel road at 30 mph on a bicycle, no hands. In addition, I distinctly felt the car was becoming airborne in the front end. It felt, above 100 mph, as if 500 pounds had been lifted from under the hood. Keeping it on an exact straight line called for a phenomenal amount of restraint to under steer on this over steering car. I got the feeling this rig wanted to head for the woods. When it came time to back off, as a turn was looming up a half mile ahead, I found it equally nasty. I sailed into the corner at about fifty and was doing just dandy. The cornering qualities of these rigs, however, are startling to say the least. They have a way of holding like glue and then all of a sudden-BANG! you’re heading for the wide blue yonder, just as you thought you were doing swell. On the next run I held my speed to 105 tops and then made my acceleration runs – which were terrific- zero to 60 in 10.8 seconds, for example. When I told Cunningham what I thought of his car, Phil Walters, of the Cunningham Co. and perhaps the greatest sports car driver this country has ever produced, said that he’d like to try it out too. (Walters may be better known to you under his racing name of Ted Tappet and is, with Willy Frick, the creator of the Fordillac). The next day Walters, Cunningham, Art Vogel, top mid-west sports car builder, and George Schrafft, owner of the Palm Beach Foreign Motors and local distributor of Astons, went back to the same road. Walters took the Aston out. When he got through with his run he said he had experienced the same sensation I had. The car felt, he said, a bit airborne and the steering had definite over steering tendencies. To double test the road, Walters and I got Briggs’ Healey-Cadillac (with its Tappet-Frick 250 hp engine). At an even 130 mph it held the road like glue and took the curve that had bothered me at 50 in the Aston, at better than 70. Ordinarily this would have been the end of all tests, but not with Cunningham; he’s a perfectionist. He asked me where I had originally tested his XK 120 and I told him about 35- miles further south on another Everglades road. The next afternoon a real sports car rally got underway, heading for that road. In the caravan we had two Aston-Martins to be tested, Briggs’ and Thorne Donelley’s, a Healey-Cadillac, a Fordillac, a special Tappet-Frick 250 hp Cadillac sport coupe of Thorne Donelley’s and George Schrafft driving the Jag XK 120 which holds the Daytona Beach foreign car record. Bringing up the rear was my plain, straight shift Cadillac. This road is fast, long and straight, a much better road than the first one I made my Aston tests on. Briggs made the first run in the Aston-Martin I had tested which had 8.5 heads instead of the more standard 6.5. He did 116 mph and on coming in reported the car felt fine to him and suggested it may have been the other road that embittered me. I then took the same car out again and let it go. When I passed the group I was doing exactly 122 mph and I must admit on this extremely fine crushed gravel hard surface road it felt much better, though I would hate to have been distracted from my driving by even a short sneeze. After this Thorne Donelley volunteered his special Cadillac for acceleration checks with the Aston. Donelley’s Caddie has Hydramatic, of all things-but here’s the catch. Walters has reworked this unit so that it never shifts before 3,800 rpm when your foot is held flat to the floor. This means extreme automatic transmission pickup as the unit will take you up to near 80 before dropping into high. This, coupled with the Tappet-Frick 250 hp engine makes this car a wildcat. At the beginning of the stretch, Walters in the Caddie got right on the Aston’s tail and off we went. I revved up to 5,000 in each gear before shifting and though I was reaching 60 in less than 11 seconds, the Caddie was forced to back off to keep from running over me! We stayed this way until I reached 112 mph and then the Caddie fell back and the Aston went on. I was just beginning to warm up to this little barge when, all of a sudden, at about 120 mph on an absolutely dry road I started a four wheel slide to the right. A quick cut of not more than a half an inch and I was on course again but my heart was beating hell out of my shirt front. What caused this slide I’ll never know, as there was almost a dead calm. Perhaps just a slight wind puff did it -anyhow, I went right back to my original opinion, this is no car for the amateur to wheel around at speeds of 100-plus. Walters was right behind and saw the slide, but could not explain it either. These cars seem to me to be poorly balanced. This may not be a design fault. There is a chance that the front ends, as they are delivered in this country, do not have the right caster and camber for high speed running and they may duck walk at top speeds. Later, I took out Thorne Donelley’s 6.5 Aston Coupe and made speed runs with Phil Walters driving this time and me taking notes. With the 6.5 heads we got this little bucket up to a nice 113 but Walters, like myself with the first car tested, felt a little uneasy about it. After this we went back to the original bad road with the XK 120 Jag. On this road where the Aston had scared me on my first run, the Jag held on at 120 mph without the slightest sign of wavering. The Jag actually has slight under steering tendencies and is. a safer all around car. In summing up, I think the Aston one of the best looking wheelbarrows on the highways. It has a real bearcat of an engine that will spit in the eye of any other 2 1/2 litre engine ever made. I think this rig has a tremendous potential but at this writing feel it still needs some definite reworking in the steering and balance department. In the 1951 Le Mans race the Aston- Martins made a remarkable showing for 2 1/2-litre cars. They not only won in their class but in the overall picture finished third, fifth, seventh and tenth. This remarkable feat brought loads of critical mail to my doorstep because in earlier published reports I had stated that the Aston had bad steering and handling qualities. This still goes in my book as these cars were handled for the most part by professionals. My criticism of the Aston was and still is that it is not a car to relax in at high speeds. Not all office boys become company presidents and not all secretaries marry the boss but an out and out Ford hot rod became the King of Sports Cars in England and America and almost the world. The saga of the Allard is the kind of success story that many builders of Specials dream about, but few achieve. In 1935, a driver already well known in British trials and hill-climbs entered a home-built Special in the Rough Gloucester Trial. The car was a stark four-passenger roadster fitted on a modified Ford V -8 racing chassis of British origin. High in horses, the engine hauled the car up the many backbreaking slopes at such speed that the driver won the Northwest London Cup – a premier award. The driver’s name was Sidney H. Allard. On that day was born the germ of an idea that has since turned him into one of the world’s most successful builders of sports cars. Inspired by his victory, Allard experimented further with his Special Allard took a stock Ford chassis in 1936 and shortened it with a little torch work in the best California tradition. To this he added an old beat up Bugatti body, mildly souped up the Ford 85 hp engine and, from that day on, started a winning cycle in English club competitive events, that had never before been equalled. Later in 1936, to get independent front wheel suspension, he cut the regular Ford front axle in two and ingeniously anchored the cut ends, which allowed him a sensational, if not too reliable front independent suspension job. In its new guise, the car was entered for the first time as an Allard Special in the 1936 Coventry Cup and Lawrence Cup trials. Both of these were grueling tests of stamina, but his car won both. The following year, Allard scrapped the rigid Ford front-axle beam and installed a system of independent front suspension designed by an engineer friend named Leslie Ballamy. Strange things happened to the car’s steering geometry when hitting a bump or cornering fast. But that didn’t stop Allard from scoring more wins-so many of them in fact, that several of his friends decided they wanted Allards. Outstanding among them was Ken Hutchison of Bugatti and ERA racing fame and one of Sidney Allard’s first customers. That was how in 1946 a company named Allard Motors, Ltd., was formed to build and market a “limited number of Specials.” Hutchison, eager for the highest possible power-weight ratio, specified a V -12 L- head Lincoln Zephyr engine with aluminum heads and a downdraft carburetor. This engine developed 110 brake horsepower at 3,800 rpm and transformed Hutchison’s car into a bucking broncho that called for the highest driving skill. From then on, the “Allard lads” really went to town. In the years that followed, up until Hitler tossed the bomb, Allard built many special road-race cars featuring 12-cylinder Lincoln Zephyr engines and a dozen varieties of Ford hop-ups. When World War II broke out, the Allard Special was running the wheels off all competitors, including works-sponsored entries and had a virtual monopoly of trials wins in the big-car class. Allard cars quickly went from good to terrific after World War II and already have scored nearly 40 international successes in every kind of competition from a hill-climb to the Le Mans 24-hour race. Faithful to dependable Ford parts, and able through his Dagenham factory connections to secure enough of them, Allard until recently built his postwar production cars mainly from Ford inspiration. The original J Series model, fitted with either a two-seater turtle back body, a four-seater sport body or a drophead coupe, was distinguished by a long, tapering hood curving below the level of the front fenders to give excellent road vision close up. A souped-up Ford V -8 engine of 220.94 cubic inches (3,622 cc), developing 100 bhp at 3,800 rpm, powered the rear wheels through a Ford three-speed gearbox. Lockheed hydraulic brakes did the stopping. Ford transverse-leaf suspension was used fore and aft, but a reinforced spring and a divided front axle now offered a more geometrical and less independent form of front suspension. Marles steering was employed and a ground clearance of 9 and a half inches enabled the car to buck the roughest roads without damaging the underside. After the war, Allard again started building Ford Allards, and race men like Andy Granatelli in Chicago would import the Allard chassis sans engine and install their own hop-up Ford power plants. The fact that Allard would sell a complete car without an engine is perhaps more responsible for the car’s success than any other single reason. Actually, the Allard became more important in America than in England, where it was born. A new and recent twist in the Allard production chain is the announcement that the Steyr-Allard is now in production. This car uses the same Allard chassis as is in other cars, but is combined with an ex-German army Steyr air-cooled V-8 engine. One model of this car was used by Sidney Allard in winning the title of British Hill Climb Champion for 1949. This new “sprint” car, which must mean it’s a short-snorting sports car, is to be a tour-wheel drive rig, which will make it ideal for hill climbs. It’s to be built of light alloys, and the weight will not exceed a feather 1,450 pounds. Axle to axle measurement on the drawings show it to be 100 inches, with a front and rear track of 56 inches. Another weight-saving idea in mind was the use of a magnesium alloy crankcase, aluminum heads and cylinder barrels and duralumin connecting rods, which would have saved weight approximating that of a five-foot blonde in a size 12 dress. The difficulties of manufacturing all this, however, (excluding the blonde) left the company no alternative but to use regulation materials. A power output of 250 bhp at 6,000 rpm is contemplated, which amounts to a lot of wheel-whirling. At present, the 79 mm bore Steyr, with a compression ratio of 11 to 1 develops around 165 bhp at 5,500 rpm. With the new heads and barrels of 88 mm bore, compression ratio is 12.5 to 1 and breathing characteristics have been improved. The Steyr Allard will be available with two-speed gears or in a model with four forward speeds and a reverse. This takes into account the variety of racing events possible to be entered. Detail items not yet set are the number it will seat (a single seater is proposed) and the size of the fuel tank, which may again depend on the type of races run. America’s Willy Frick and Phil Walters can take the bow for the Allard’s outstanding popularity throughout the world. They installed in an Allard chassis for Tom Cole, an English driver racing in America, the first Cadillac engine ever to sit between an Allard’s frame members. The firm of Tappet Frick (Ted Tappet is Phil Walters’ old racing name) started the ball on its onward rush. With the Tappet-Frick Cadillac installation the Cadillac Allard became the most outstanding winner of sports car events in America, with a record not even closely approached by all other makes of foreign sports cars combined. Wins and course records at Bridgehampton, Watkins Glen and other major sports car events started to go to the Allards. With the introduction of the Chrysler V-8 engine, which also drops into the Allard chassis like an olive into a martini, the 1951 Bridgehampton race and course record was smashed into a thousand pieces, erasing the old Cadillac Allard records. And while we’re on the subject of engines and Allards, a question has been raised as to whether the Cadillac engine offers improved performance over a modified and souped Ford-Merc mill in the J-2. It has been tabulated and proved that the Ford-Merc can be made to equal a slightly modified Caddie motor by using the proper gear ratio to take advantage of the Ford-Merc’s higher rpm. The cost of installing either engine runs about the same, but the wear and tear on the higher-revving Ford motor would kick it out of commission faster than the Cadillac. Numerous other motors have been tried or have been thought about in connection with the Allard chassis, but from what I’ve seen, I’ll continue to stick with the Chrysler Allard or the Cadillac Allard. What’s it all about? Is the Allard the greatest sports car in the world? No, but it comes pretty close. What’s better you ask. On these shores where the best products from abroad compete, the Allards have been almost invincible. It’s a cinch to say a Ferrari or Aston-Martin or Jag XK 120 is better, but at the finish line this doesn’t seem to hold much water. The Allards have taken them all, time and again. This has been a great source of frustration to the pure pro-foreign products boys but maybe there’s an answer. In the first place, the Allard is a comparatively cheap sports car to buy. With a Cadillac engine it sells for just a hail under $4,000 delivered in America and that’s penny-ante stuff when compared with the price -tags on Ferraris, Alfas and even Aston-Martins. The biggest thing in its favor is the fact that you can buy one without an engine and install a Cadillac or Chrysler engine in it. Now, I have written many times that I feel there are no engines in the world better than either of these engines from the standpoint of performance and reliability. Here’s where I get in an immediate hassel with the pro-foreign so called purist. They can point out and rightly so, that the Ferrari engines or a dozen others show far superior weight to horsepower ratios, much better performance per cubic inch displacement and a dozen other factors that make the imports far superior to our big monstrosities in every way except one the most important one-they can’t beat our big slobs over here. On these shores there are two definite schools of thought. One favors magnificent high horsepower performance out of peanut size engines, sometimes blown, and the other prefers huge power plants of mammoth displacement with terrific torque. The peanut boys are all out for developed horsepower through extreme rpm and the torque boys want wall smashing torque at low rpm. I have heard the virtues of both types of power plant argued all night and into the dawn, but in my book there is only one answer. The torque boys have kicked the teeth out of the high rpm boys consistently in American races. I do feel that the Allard, plus American power plant, is one of the world’s best. All the cars in this top ten are postwar offerings that can be bought today. If not, this list would be super silly, omitting such cars as the Mercedes which is now building small family jobs and no competition stuff. The Italian Maserrati, one of the world’s greatest (Indianapolis two-time winner) in the prewar days is, we understand, just being organized again by the Maserrati brothers. The famed BMW (Bavarian Motor Works) and many other European champions of the past have not gotten back into the sports car picture yet, if ever. It is even rumored as this goes to press that the late Ettore Bugatti’s son is about to bring the great Bugs back again. The Auto Unions are now utility trucks and the present Porsche and Volkswagen are the only passenger cars being made in Germany that are the true descendants of the once almost invincible Auto Union race cars. The cars I have selected are listed in alphabetical order. No sports car ever built can boast a longer or more successful record than the great Alfa Romeos. Their record of major Grand Prix wins goes back to the days when Hitler wasn’t even a good house painter and Alfas’ supremacy on the European circuit was only interrupted when Hitler quit house painting for blood letting and took over the mastery of the Grand Prix courses with his government subsidized Mercedes and Auto Unions. Today, Alfas are still reaping their share of glory on the European raceways but, for the most part, with rebuilt prewar models that were designed back in ·1938 by Tulio Colombo, the man who is now making the Ferraris such a success. The supercharged 1.5-litre engines have been reworked and the prewar 300 plus horsepower boosted to a full 400. These cars are still among the greatest ever built. The Alfa belongs to a quartet that has made sweet harmony in scoring a large number of wins in every type of European racing event. The other three are, of course, Bugatti, Mercedes and Bentley. The decade that witnessed the popularity of hip flasks, racoon coats and F. Scott Fitzgerald was the time, automotively speaking, of the Alfa Romeo. Those were the years the Alfa really began moving ahead, on the track as well as in popularity. A 1,500-cc open roadster with six cylinders and a double-overhead camshaft gave practically everything else in its class a button shoes, old hat, look. From the open rig another 1,750-cc car evolved, available with or without the Roots-type supercharger. The Seventeen-Fifty, as it was tagged by the period’s car lovers, packed an impressive wallop both in speed and in pickup. Steering, gear-shifting (four-speed, close ratio crash-type gearbox) and brakes were all superb. This machine is still a looked-for collector’s item. Even more glamor was attached to the 2.3-litre model that followed. This was an unusual straight-eight with the twin overhead camshafts operated by vertical bevel drive from the middle of the cylinder block. The Roots-type blower gave it terrific performance with an acceleration that would match a souped-up motorcycle. Probably the most successful of the racing Alfas was the 2.6-litre, Type P3 (Monza), which had the 2.3 cylinder block bored out for greater torque to .2,650 cc. Designed in 1930 by Engineer Jano, it featured two superchargers and twin driveshafts in V -shape carrying power to the rear axle. Suspension was by outboard, underslung semi-elliptic springs of exceptional width. The tubular front axle was set well forward of the radiator in a fashion characteristic of the period. Again a fourspeed gearbox with straight-cut teeth was used. The car had a stark, purposeful single-seat body installed. Between June, 1932, and September, 1933, this newcomer put Bugatti noses out of joint by getting the checkered flag in no less than seven Grand Prix races. It was a machine favored by ace driver Tazio Nuvolari who used it to score some of his greatest victories. The German answer to the Alfa (the Type 163 Mercedes and Auto Union, both subsidized by the State) caused the gradual eclipse of the Italian racing star from 1934 onward, though nothing of comparable size could touch the Type 158C Alfette on its few appearances. Even now this remarkable machine remains virtually unbeatable when competing in its class. The Monza was followed in 1933 by the Type B, a 2.9-litre job also with twin drivshafts, and then by a completely new model (production and racing) styled the Type Photo Is of the individual wheel suspension and brake case on the Alfa Romeo Super Sports model 308. This, too, used a 2.9-litre, twin-blown engine but featured independent front suspension by coil springs and transverse rear suspension. In 1935 two more racing Alfas were introduced: the 3.2 and 3.8-litre models, both with straight-eight double-overhead-camshaft engines. The former had Dubonnet independent front suspension while the 3.8 was the second largest Alfa ever built. Largest was a 4-litre, 12-cylinder job that appeared at Roosevelt raceway in 1939, driven by Nuvolari. Neither had enough to beat the German cars. The Alfa, like the British Bentley, was the only car to win the Le Mans 24-hour race four years in succession -from 1931 to 1934. Winning the French Grand Prix in 1924 was the company’s first important claim to fame. By 1925, Alfa Romeo had a racing reputation that was testified to by an action of Mussolini’s Fascist Italy. They dissolved the original corporation and put it under the Italian Ministry of Finance as a member of the Corporate State Industry. This was considered good propaganda ammunition, having the government produce such excellent cars! This shifty business by the rock-jawed dictator, with the stress on the propaganda value of having Italy produce bigger and better everything, may have been one reason for the subsequent successes in the car’s racing career. Winning a race became somehow mixed up with proving the superiority of an idealogy, and it was not like Musso to tolerate a loss of prestige. The chances are good, of course, that even without the external pressure to produce a winner, the Alfa Romeo would have had little trouble copping cups. The entire outfit, to further delve into the nationalistic details, was originally French, but that was back in 1906. In those days there were no better cars than the French, and the French automotive manufacturers were looking to spread their interests to foreign lands. A. Darracq & Company, which also had a finger in English interests (STD) , began its operations in Italy in Naples. By 1907, the French company was suffering the after-effects of the depression which hit the United States. They found it expedient to sell out to a Milan banking firm, which formed the “Anonima Lombarda Fabbrica Automobile.” Breaking it down by initials gives us ALFA, which explains a spelling that has probably confused a number of Greek scholars and fraternity men. By the time this firm was on its feet and producing 350 cars a year, the Germans loused up the detail (and the world) by launching World War I. This appeared to be the end of an interrupted career for the car company, but again the firm was saved, this time by the money and foresight of one Nicolo Romeo, a Milan industrialist. Alfa Romeo, the present day name for the car, was derived from this combination of events. The historical background of the car also explains the unusual emblem used, which includes the cross of the city of Milan and the crowned serpent of the House of Sforza. Romeo, a type who evidently never stood still if he had a chance to move, wasted no time after buying the company out. He began immediately to produce aircraft engines, and by 1917 was delivering a new in-line overhead camshaft airplane engine, used extensively by the Italians. This production accounts, in part, for the excellence of the automobile engines manufactured by Alfa Romeo. To toss in a home-country slant, it was the United States that furnished the high-precision tools with which Alfa made his engines for the First War effort and which later on gave an assist in producing the engineering gems of the Twenties and Thirties. The second World War put the company out of production in a violent way. The United States Air Force used high explosives to do the job. After the war and after having weathered a number of depressions and World War I, plus the usual business hazards, Alfa Romeo again began to produce. They lost no time in producing cars which have amazed the world for performance, beauty and construction. What they drove off the finishing ramp set the Detroit manufacturers to copying their style in a subtle and not too subtle way. The new Alfa Romeos are magnificent convertibles and hard tops, capable of speeds of around 110 mph which they get from a 2.5-litre unblown engine developing 115 horsepower at about 4,800 rpm. This engine is a six-cylinder job with double overhead cams, multiple carburetion and 7.5 to 1 compression ratio. When the road is your playground and your car loves it – then you’ve got yourself a sports job, McCahill avers. A sports car, this writer feels, can be best described as a state of mind. The owner of a Jaguar XK 120 or an M.G. who uses either of these for competition, or just plain fun, is the owner of a sports car. The kid who builds a hot rod either to impress his friends with the Bankhead baritone of its exhaust or to use in straight-away speed trials is the owner of a sports car. By the same token, who is to say that the gay blade who buys a sedan with an eye on the comfort of the back seat for pleasanter parking on Old Ox Road. doesn’t own a sports car? So you see a sports car is a state of mind and now, with your indulgence, I will narrow this wide sweeping label down to the road race car classification. These could and should be divided into two distinct categories, namely catalog factory competition cars or open-class cars which may be altered catalog jobs, complete build-ups which might include the component parts of many catalog rigs, and in this open class may be new model cars from the tires up, too. This immediately brings up the question of hot rods and rightly so. Through an unfortunate lack of diplomacy on the part of some officials at sports car events, hot rodders have been barred from competing without a proper explanation that this is due tor heir cars being hot rods, but because they are unsafe for road racing and would be a menace to the other competitors. Unfortunately, many of these hot rod owners have felt they are barred because they own hot rods and for no other reason. To prove the fallacy of this, the two principle sports car events in America in 1950 and 1951 were won by hot rods and nothing else. The Bridgehampton race was won by a Cadillac Allard in 1950 and a Chrysler Allard in 1951; and the two main events at the Watkins Glen Grand Prix were taken by a Cadillac Healey and a Cadillac Allard in 1950. If these cars are not hot rods then there are no such things as hot rods. Where these cars differ from the popular conception of hot rods is that they are built on chassis with superb road handling, cornering, steering and braking characteristics unknown to American stock family cars. Most hot rods that Americans hear about are built on modern Detroit chassis and these are rarely altered sufficiently to make them safe on a hard cornering course with other cars competing alongside them. Where most American sports car groups have fallen down is in not having a definite standard posted which every car must meet before it can compete. If a clear-cut formula were set down in black and white by the sports car groups pertaining to steering, brakes and suspension and if this were closely adhered to, no owner would object if he were barred from a road race for which his car was not qualified. Ratio of steering wheel turn to front wheel turn is highly important in road racing and the current American eight-day clock winding type is far too dangerous in tight spots or hard corners where fast counter-control may be necessary. Incidentally, this is not an exclusively American feature, as one of England’s newest numbers, which has enjoyed reams of good publicity, steers like a Mississippi showboat and should never be allowed on a race course.Suspension is where the typical American hot rod falls down and where the real engineered road race car excels. Hot rods that are built for straightaway lake trials (again on American stock car chassis) might need a ten-acre lot to maneuver a hard corner at high speeds. Brakes are another factor to be considered. Unless correct provisions are made for brake cooling and unless the linings and brake drums are designed to take a constant beating, brake fade is almost a certainty, i.e., no brakes, which is a very hot spot to be in when you are closing in on a corner at 90 or 100 mph. Without considerable reworking, no American brake delivered on American production line cars today is adequate for hard racing or cornering and this again, to keep the score straight, is not peculiar exclusively to Detroit products. The early models of the famous Jag XK 120 had a nasty way of losing all braking power after a few hard laps and many skilled drivers found themselves in the embarrassing position of having to run up escape roads because they couldn’t stop. On close examination, the drums were often found to be untrue and by turning them down and adding different shoe lining, many of these early XKs were made into decent competition road race cars. With the revival of interest in road racing in this country and participation in European Grand Prix, there are signs of correctly engineered sports cars being produced here at home. These cars will be safe to qualify for competition on the basis of steering, suspension and brakes. We now have the Nash Healey, the Crosley Super Sports and the Cunningham in this group. True sports or competition cars, once successful and popular on these shores, left the American scene in the early 1930’s during the terrible depression, when it would have been considered bad taste to indulge openly in such expensive luxuries while many who had owned these fancy rigs in the past were seriously wondering where their next meal was coming from. By an odd twist of fate, the countries in Europe that are now struggling up from the bottom with loans from Uncle Sam, hit their highest peak of competition car perfection during those same years. It was in the 1930s that Herr Hitler came into power and under his subsidies Germany produced the finest racing machines ever conceived by man. His pompous pal Mussolini was his only serious competitor for world supremacy on wheels. Not far behind was France’s adopted Italian genius, Ettore Bugatti, who built classic sports cars that will go down in automotive history as among the greats of all time. I can hear that guy who just laid out his dough for this book screaming, “Hey, how about the English?” Well, how about them? The following may come as quite a shock to some readers, especially the young ones, but the fact is, English road race cars have not been really major league for over a quarter century, until 1951. They jumped into prominence after World War II first because other European builders took longer to get back into production, The English Jaguar XK 120 world stock car speed trial record of 132 mph fell by the boards to a newer Ferrari which posted a sizzling 149 mph over a European track. The English hold the distinction of being perhaps the world’s greatest sports car’ enthusiasts and their automotive writers, and there are hundreds of them, enjoy a following in England equal to that of our baseball writers in America. The English are the cheer leaders of the sport and their racing clubs are the best in the world. I sincerely believe they get more genuine fun out of automobiles than any other group of people on earth. Author Roque E. de CamposPosted on July 31, 2017 August 3, 2017 Leave a comment on What is a sports car? As it was already said, the Franchise became him and I would add, he became the Franchise. Although he tested over 600 cars, unless we had the full collection of Mechanix Illustrated, we car fairly find at the Internt some 50 tests, maybe less. of a sports car theme stage show and all those kicks. The opening is the 27th and Tom appears driving the “hero” car in the filmed sports car race. Then he plans to compete for the duck shooting championship of America (he won it in 1956 and was runner up in 1959). Next on the schedule Jeanne and tom will go to Exeter, N.H., for an annual meeting of the Society of the Cincinnati. In which Tom has been nominated to head a standing committee Then back here in a few weeks. Obviously he was a noted automotive writer. As discussed previously, he inaugurated the idea of testing for cars. He sold the idea to Mechanix Illustrated, which was a Fawcett Publications periodical, from the 1940’s to the early 1970’s. Interesting to notice that the Magazine refused to acknowledge his death and kept his column as Tom McCahill Reports that was ghostwritten by his stepson Brooks Brender. We will use a lot of the material he left at Mechanix Illustrated. The Modern Sports Car Prentice Hall, Englewood Cliffs, NJ, 1954. Tom McCahill, Today’s Sports and Competition Cars, Prentice Hall, Englewood Cliffs, NJ, 1954. Tom McCahill, Tom McCahill’s Car Owner Handbook, Arco Publishing Co., New York, 1956. Tom McCahill, What You Should Know About Cars,Fawcett Crest Books, Circa 1963. I have fortunately managed to get all these books an I had a lot of fun reading them. It is not practical, and not necessary to transfer all the contents of his books to the Internet, not to mention that this might incur breaking some copy rights. To prevent this I will limit the use, although more than 60 years already passed, and there should be no contention about. Probably, sometime in the future, somebody will think of publishing all of them as it has been done with Mechanix Illustrated old issues. 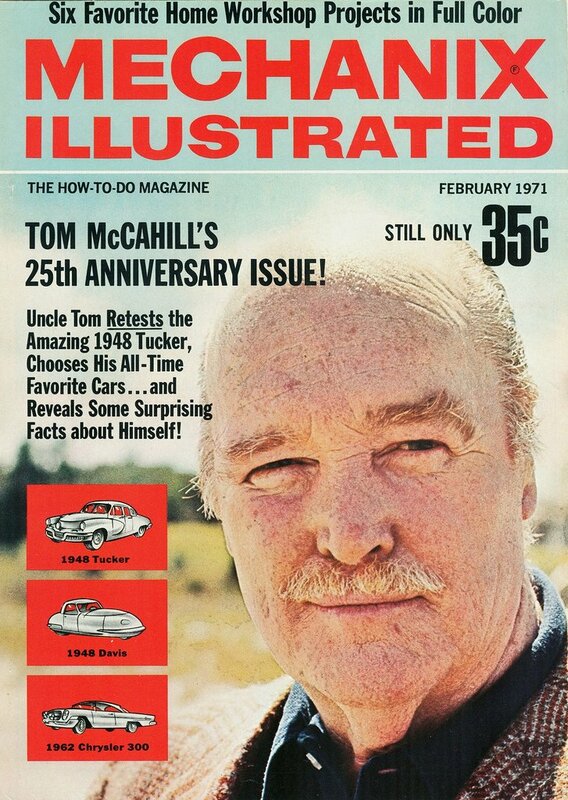 I should mention that this whole exercise is void of money oriented aims, my idea is to honor Uncle Tom McCahill, give him the credit he deserves for inventing the car reviewing business, save it for posterity and, maybe above all, have fun! It can fairly be split in three groups: Books, Handbooks and Car Testing, mostly at Mechanix Illustrated. From The Modern Sports Car: Dedication and It All Boils Down to this. From Today’s Sports and Competition Cars: Dedication and What It’s All About. member of the Yale University Sports Car Club. He was a real sports car fan and loved high speed driving. By now, if you have read all the mumbo-jumbo that has gone before, you must realize sports car people are just a few notches different than the dyed-in-the-wool, conventional mugwump. In a sentence or even less, a word, it all boils down to one simple fact-sports car people have the “feel.” Maybe it’s an appreciation for the better things of life, or a normal revolt against regimentation on a commercial scale. One thing is certain, the true sports car man revolts against taking to the highways like a duck parading with millions of other ducks in vulgar creations created to catch the eye of vulgar people. As this book is being put to bed, the writer has noticed an increase of idiotic Sunday newspaper supplement articles slanted to soothe the Detroit ad buyers by condemning all types of sports cars and sports car owners. These are generally written by intellectual delinquents with no mechanical, and very little family, background. These Union Square soap-box editorialists usually have the literary talent of a Borneo gorilla and usually only succeed, I am glad to say, in interesting more people in sports cars. Unless you have the “feel,” sports cars definitely are not for you. The man who doesn’t feel that his MG, Austin-Healey, or Jaguar is a sporting and adventure companion just doesn’t have it. I realize many sports cars are bought primarily for show-off purposes, but this is only a small part of what the sports car man knows about the sport. Let’s take a hypothetical trip in a sports car, all alone. Actually, although you never tell this to your wife, sports car driving on a trip is more fun alone. You don’t need your wife or close friend to keep you company-your sports car is your good companion. It is impossible to get this feeling with a cold, Detroit commercial stamping. Let’s say your car is a little Austin-Healey. Everything about it is top quality of the very finest material. Unlike your Cadillac, Lincoln, or Chrysler, you have a feeling for this little car, an affectionate regard almost like one you have for that good dog you own. When on the highway, you often talk to the little car as if it had warm blood running through its veins. Well, it is a friend, and warm liquid is running through its veins, though in this case it doesn’t happen to be blood. After the car has given you exceptional pleasure on a fast 100 or 200 mile jog, which may have been a business trip or to another friend’s for a weekend, you often, as you get out, give the fender a friendly pat of thanks. (How long since you’ve patted a Cadillac?) The man who does this has the “feel.” He may never race, enter a hill climb or a rally, but he has the “feel.” Let’s say you work in New York and live in New York, and garage your little jewel in a not-too-tidy auto hotel where it is continually surrounded by unaesthetic iron. You find yourself often just before you turn out the lights at night wondering how they’re treating your pal over in the garage and whether dirty hands have been marring its highly polished finish. Our hypothetical trip, and it actually happens every day to thousands, starts in your office. Old Joe Blow, the firm’s wealthiest client, wants you to come down to his plantation near New Iberia in Louisiana for some late fall duck shooting and the possible discussion of future plans. Your secretary checks the air schedule and trains. By plane, it’s just an afternoon’s hop, but you elect to do something that has the other men in the office slightly suspecting your sanity when you announce that you’re going to drive down in your Austin-Healey. You don’t get mad at the many questions, such as, “Supposin’ it rains, can you keep dry in that bucket?” or remarks that it would be a lot safer and cheaper to fly. You don’t try and explain-these fellows have all the adventure in their souls of a meek ribbon clerk and couldn’t understand if you told them. So you just say goodbye when the time comes and leave the office ignoring a wisecrack or two about walking back or hitch-hiking. It is exactly four A.M. when your alarm clock lets go like a furious rattlesnake and, with high adventure ahead, you’re out of bed and wide awake in the first jump. Twenty minutes later the sleepy night elevator man in your apartment building eyes you suspiciously as he takes your gun case, duffel, and kit bag. You leave these in the lobby and make the two block risk walk to the garage. The night garage man openly looks at you with suspicion as he shufflingly leads you over to junior, parked way in the back between two man-made mountains of chrome. You give it a fond pat on its left flank and slip behind the wheel. The top is up and the passenger side curtain is on. With the adequate heater and your big greatcoat you won’t need the other side curtain as the temperature outside is a mild 40 degrees. You turn the key and instantly the engine roars awake. You let it idle for several minutes and then pull up to the gas pumps. The tank :filled, you drive back to your apartment for the bags and your gun and, with these in place in the trunk, you head for the Jersey Turnpike. The speed limit is 60 MPH and in overdrive the engine is happily loafing at 70, a speed you calculate will not attract John Law. You are just settling down to the trip when a turnpike all-night restaurant-service-station looms, reminding you you haven’t even had your coffee. After a good, solid breakfast (the driver on a long trip needs plenty of fuel just as the car does), you emerge from the diner and find that it’s just daylight. Now you’re really on your way at your steady 70. The car wants to go faster, but you hold off, the cops are thick on this throughway (in more ways than one). As the sun comes up over your left shoulder, signs indicate Philadelphia somewhere on your right. The engine is purring a song that no symphony could compare to. As they say in the Ozarks, boy, you’re really livin’it up! – and you know it. Ever since you pulled out of the tunnel back in New York there’s been a tingle in your spine, areal,perpetual, underplaying thrill that seems continuous. In a short time you’re over the Delaware Memorial Bridge, a short shot through Delaware into Maryland and onto the great Chesapeake Bay Bridge. As you cross the bridge you slow down, noticing several Hocks of canvasbacks trading back and forth. The fact that you’re going all the way to Louisiana for duck shooting momentarily strikes you as a little silly when right now you are over some of the greatest duck shooting water in the world. Around Annapolis and over to U.S. 301, and then the high Potomac Bridge and more ducks. Now you are in Virginia. At Port Royal you pull up for a second breakfast and re-fueling. It’s only a quarter of eleven, the day’s young. A fast trip through the City of Richmond, and then a s-l-o-w drag through Colonial Heights and Petersburg. Once clear of Petersburg you snap back to life quickly and head for South Hill and Raleigh. At three o’clock you’re not even tired, though you’ve been driving ten hours, at moderate speeds for the Healey-which made the trip effortless. In Raleigh you get yourself a late, late lunch or an early dinner and head for Southern Pines on U.S. 1, 70 miles further south. In the outskirts of Southern Pines you find a beautiful motel with a restaurant and a vacancy, so you pull in. It is five o’clock and you’ve covered just under 600 miles. The year before when you made this same trip in your Detroit car you were pooped, but tonight after a quick shower and shave (so you won’t have to do it in the morning) you feel like a million dollars. You smile back friendly enough, but don’t try and explain. Ignorance knows no limitations and your mission in life is not the education of the multitude. Happily, you find the motel coffee shop open at six the next morning. After a big breakfast of flapjacks and grits, you’re on your way once again, bowling down U.S. l. On the way back you’ll come by way of Atlanta and the Piedmont Trail, but this time you’ll stay on U.S. 1 until just south of Augusta where you head west for Macon and Montgomery. Down to Mobile and along the Gulf on #90 to New Orleans. Then the short run to the plantation on Vermilion Bay where the mallards come up like thunder just at the break of day. By nine o’clock you’ve taken the passenger side curtain out, and by ten, when you stop for a second breakfast and re-fueling, down comes the top itself. It’s late November, but the temperature is in the high sixties. Just after eleven o’clock you make the swing west a few miles south of Augusta. The deeper you penetrate the South, the more attention your car gets, especially from the children on the roads, who wave and yell gleefully as you pass. That afternoon, after leaving Montgomery, you head south toward the Gulf and at night you pull into another motel near Mobile. At noon next day you are in New Orleans and stop off to see your old friends at La Louisianne, that fabulous restaurant, for a meal that no king has been able to buy for some time. and you never have to slow for a corner but just keep bowling along. Old Betsy, your prize-double barrel gun, did you proud, and you suddenly realize that the deep affection you have for this gun that was given to you before you entered college is similar to the feeling you have for this car. Both fine pieces of sporting equipment and both good companions. You understand this, you have the “feel.” Those realists can have their reality, this is for you. A man’s gun and a man’s car. As you unload in front of the apartment you realize a great adventure-nothing really much, no lions, no tigers, no rescues at sea – but a great adventure you and your friend, the car, a sports car, have had together. Let’s Start with Sports Cars, the first on the left above. Better yet, let’s not forget the staff behind, probably already gone, by with my thanks and to the best of my knowledge, without breaking any copyrights, since I will limit the use and more than 60 years already passed. Perhaps, sometime in the future, when the subject is exhausted I will think of publishing it as it has been done with Mechanix Illustrated old issues. You can navigate in the world of Uncle Tom McCahill either from above or directly at Home , where you will have stacked all blogs so far. Uncle Tom McCahill Blog at WordPress.com.